Make Great Northern happen and support our Kickstarter! Twin Peaks is a show rife with symbolism. Many of these symbols have permeated our collective culture and become readily recognizable short-hand for the show and its themes. I wanted to use some of these symbols in simple home decor; something that would be a relaxing knit with the end result of an attractive FO that you can put up on the wall and look at every day. 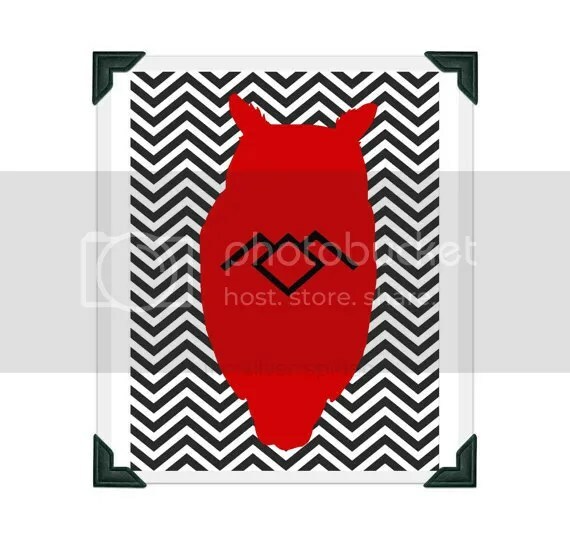 Below I’ve included some images from talented and generous etsy sellers who have also used Twin Peaks’ symbolism to create. This print includes the famous zigzag, found in the frightening, upside-down world of the Black Lodge. It also skilfully integrate an owl silhouette (a familiar, of sorts, with BOB), and the mysterious Owl Cave symbol. 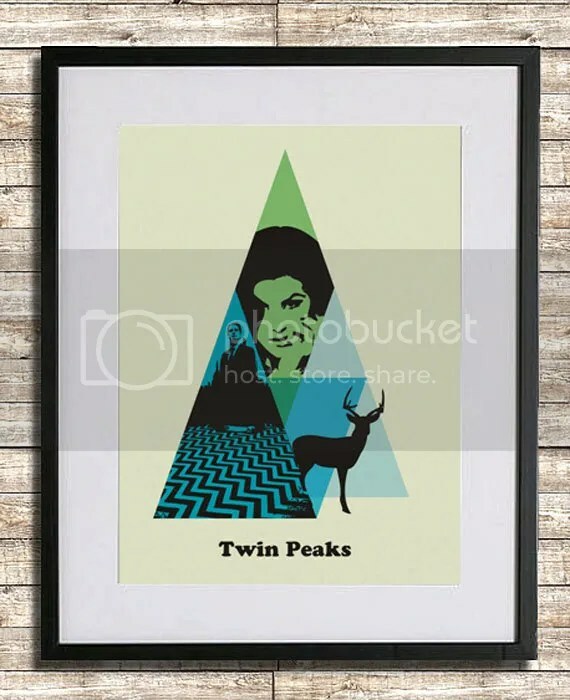 This print includes simplified images of two of the show’s most popular characters, Agent Cooper and Audrey Horne. There’s also the zigzags, and silhouette of a deer. Twin Peaks paints a picture of a town that a little rugged, on the edge of wilderness and “civilization”. A place where the woods hold unsettling mystery and the creatures are not what they seem. The deer is a part of this world; of course, there’s also the stuffed and mounted deer head in the Sheriff’s office. 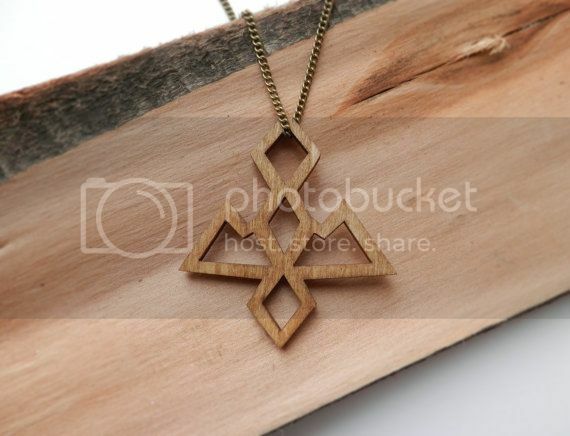 As this seller writes herself, this symbol is a clue to finding Laura Palmer’s killer, found in the mysterious Owl Cave. My own design is also inspired by these plethora of eerie and beautiful symbols. The original inspiration for the wall hangings came from Shelly’s house. There’s a SUPER retro looking wall hanging above the couch. Go ahead and re-watch. You’ll love it. There will be more than one wall hanging design. Each will be a manageable 1′ x 1.5′; perfect for decorating your wall and using up precious, lovely yarn. The yarn support collaborators for this pattern are Berocco and Lorna’s Laces. Each yarn line contributes strengths to its planned wall hanging. The beautiful solids and variegated colours of Lorna’s Laces will work together with interesting texture to create simplified, geometric reproductions of those eponymous peaks. The attractive textures and quick knit weight of Berocco will produce a stark, stunning reproduction of some of the symbols you see above in these images. Can’t wait to see more? Want to stay in the loop? Just join the Great Northern mailing list.